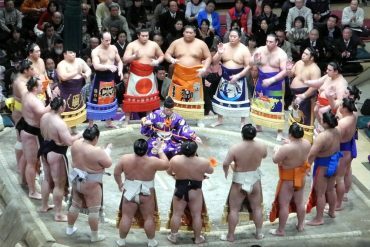 It’s been a big month for The Real Japan on Twitter. I like the immediacy of Twitter, and how you can strike up a real-time conversation anywhere in the world – with a person you’ve never met. I’ve also ‘met’ people on Twitter that have gone on to become ‘real-world’ friends – which means a lot to me. Like these posts? Please subscribe! I also look forward to reading the tweets of those I follow. They frequently inspire, enlighten and entertain in equal measure. 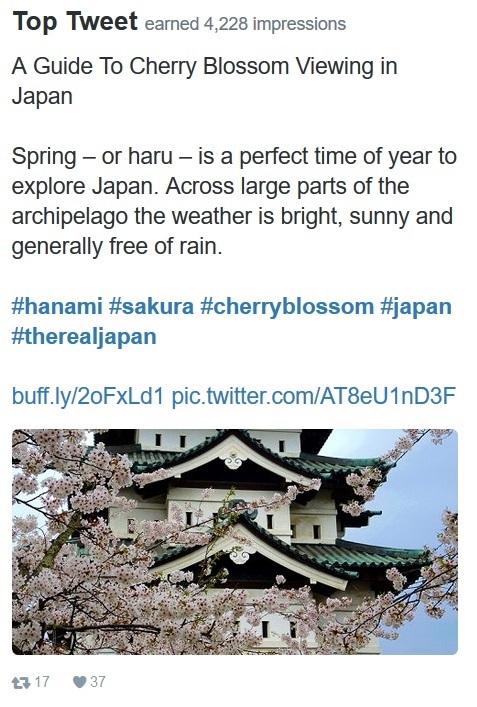 It being spring as I type this, it comes as no surprise that our #1 tweet this month was about our Guide To Cherry Blossom Viewing in Japan. 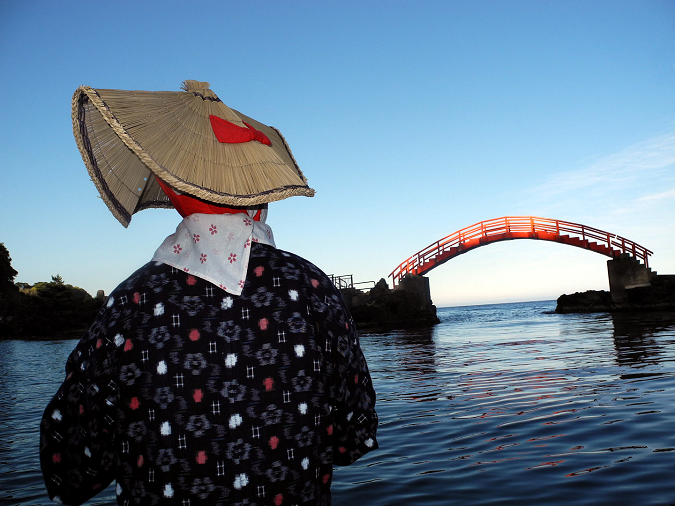 Myth-busting is a big part of the ideas behind The Real Japan. So it’s nice to see one such myth-busting post was in the Top 5. 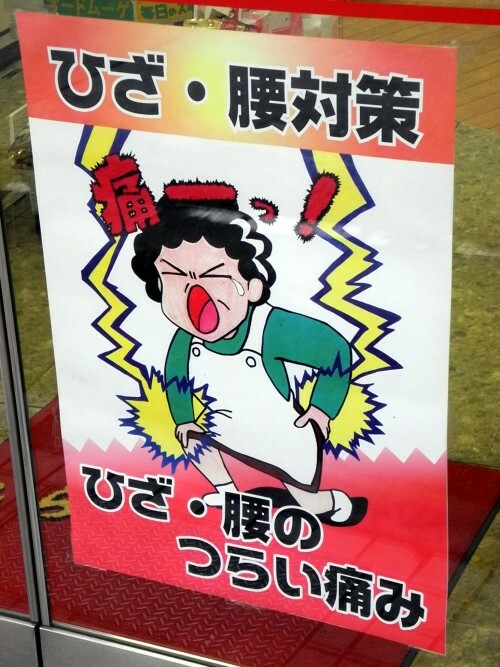 And it is one of the most persistent – that Japan is prohibitively expensive. Whilst it’s fair to say Japan isn’t the cheapest country you’re ever likely to visit, it often also isn’t as expensive as many people expect it to be. 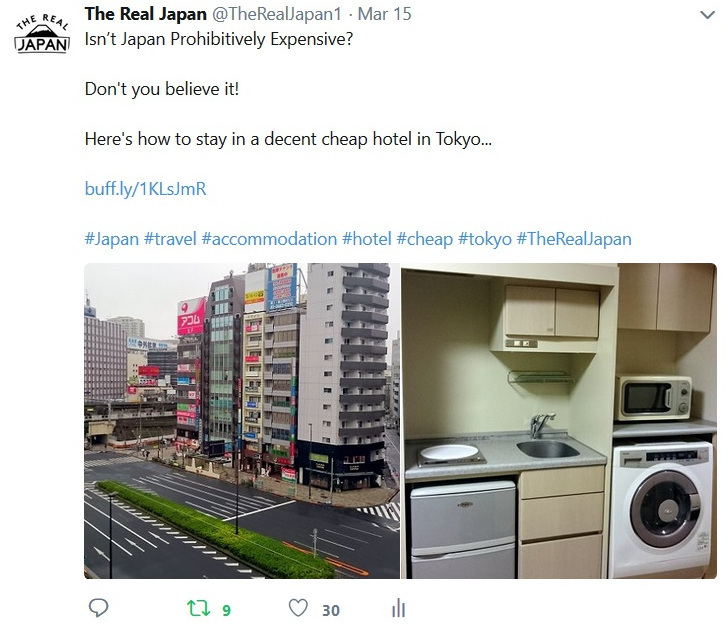 This article on how to stay in a decent cheap hotel in Tokyo is always one of my most popular. Kawaii (cute) and food are two popular aspects of life in Japan. 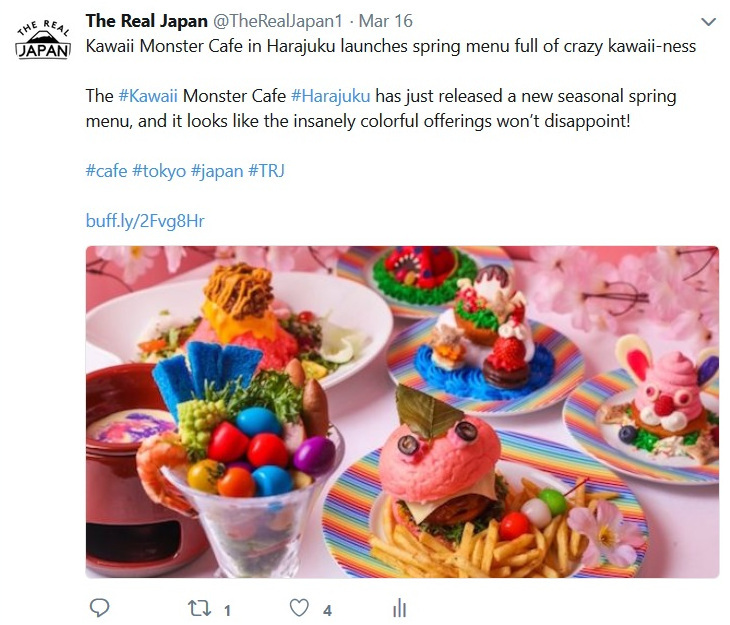 So it comes as no surprise that a post about the Kawaii Monster Cafe combining both of those also features. You can make your reservation for Kawaii Monster Cafe (Official Partner) here. Our next entry in the Top 5 is another post about viewing sakura (cherry blossom) in Japan. 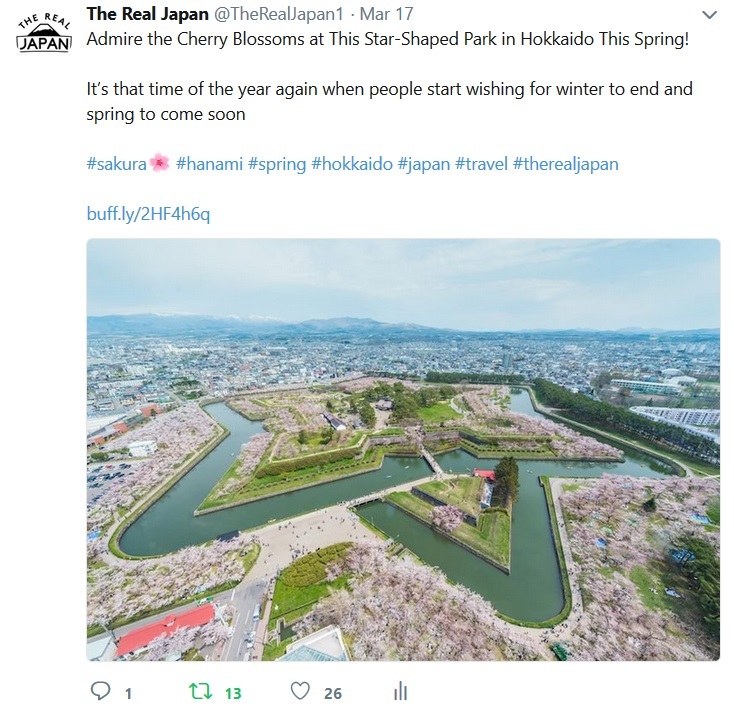 This one was about the stunning star-shaped Goryokaku Park in Hokkaido and included an incredible aerial photograph of the spectacle. 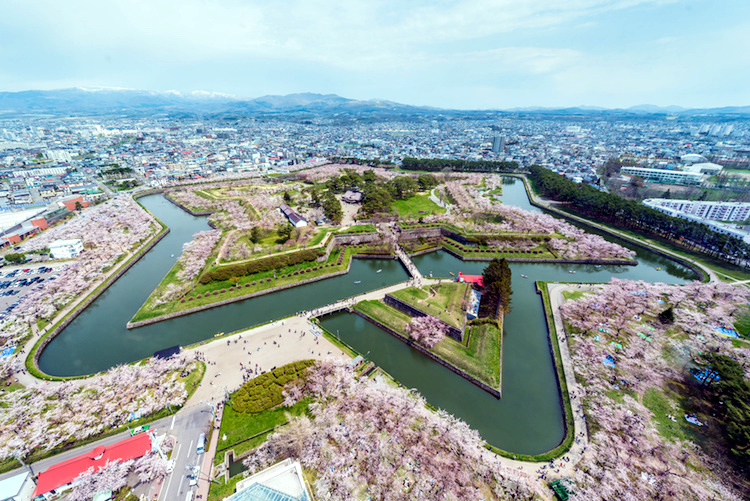 You can see the beauty of Goryokaku Park (the star-shaped park above) as part of this tour of international harbour town Hakodate in Hokkaido. Japan is also famous for Hello Kitty and the legendary shinkansen (bullet trains). 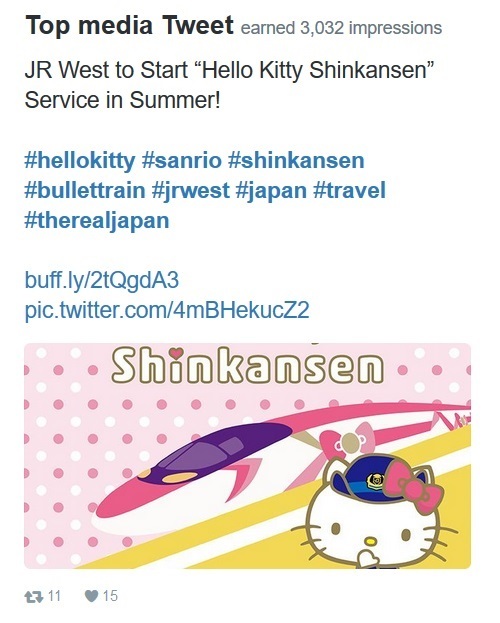 So a post about the introduction by JR West of a Hello Kitty themed shinkansen was always going to be popular! 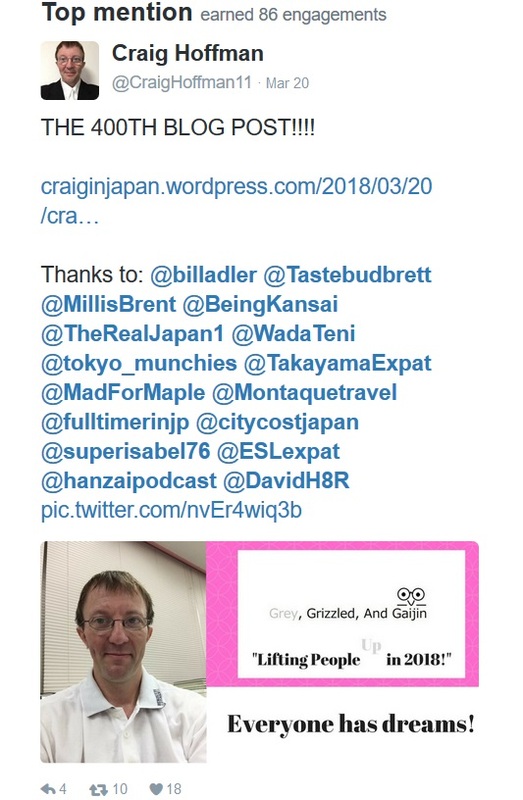 Popular blogger and writer Craig Hoffman gave us several shout outs, but this particular one, announcing his 400th blog post, got the most engagement and was our top mention in a tweet. You can read more about Craig in this recent post. You can follow Craig on Twitter HERE. Our Top Follower this month is American TV host Andrea Feczko. Andrea presents the Vacation Creation show on ABC and has the popular How 2 Travelers YouTube channel looking at global travel. You can follow Andrea on Twitter HERE. If you’re not yet following me on Twitter, it would mean a lot to me if you connected. JUST CLICK HERE (@TheRealJapan1). Our Guide To Cherry Blossom Viewing in Japan. This article on how to stay in a decent cheap hotel in Tokyo. 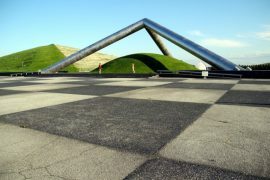 Visit star-shaped Goryokaku Park as part of this tour of international harbour town Hakodate in Hokkaido. Follow novelist and social media guru Craig Hoffman on Twitter HERE. Follow American ABC TV host Andrea Feczko on Twitter HERE. If you have any thoughts or comments please let me know by leaving a comment below!